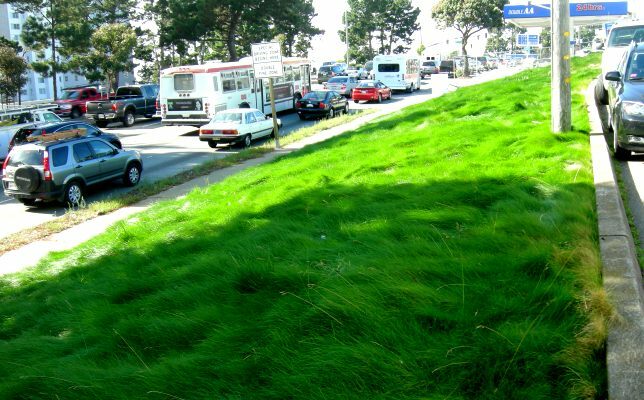 In 2010, I wrote about the no-mow fescue planted on the side of Junipero Serra, right where it turns to Portola. Here’s what it looked like at the time: a dramatic green, with a furry texture. 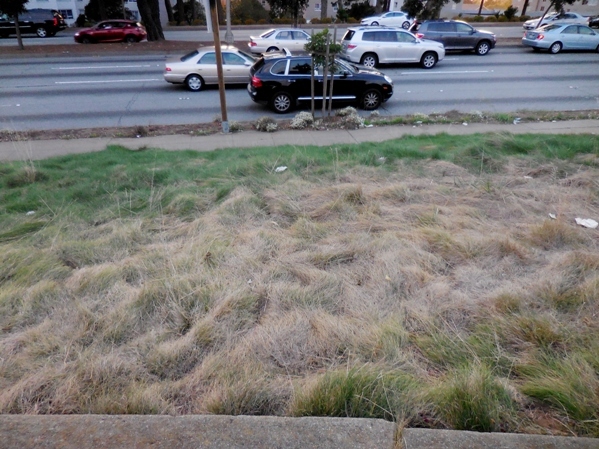 A year later, it was dry and looked more like hay, and I wrote about it again as ‘shaggy grass‘ in 2011. Since I pass that way a lot, I have often thought of doing a follow up – especially this summer, when the whole thing had an interesting patchy look. It was brown for the most part, but green in the shadow of the big tree growing there. Unfortunately, I didn’t get round to taking a picture until a few days ago, when the contrast was less dramatic. But it’s still evident. This is the grass where it’s dry. And here’s what it looks like under the tree. I can’t figure if the tree is helping the grass by shading it, or by watering it by harvesting fog, or something else. But within the outline of the tree, the grass is green. 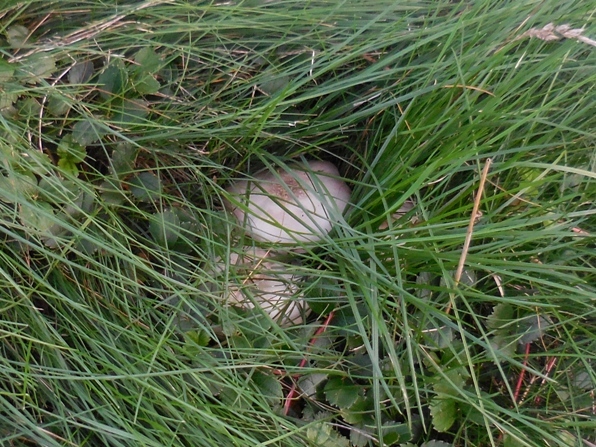 I also found a bunch of mushrooms nestled in the grass, like these here. 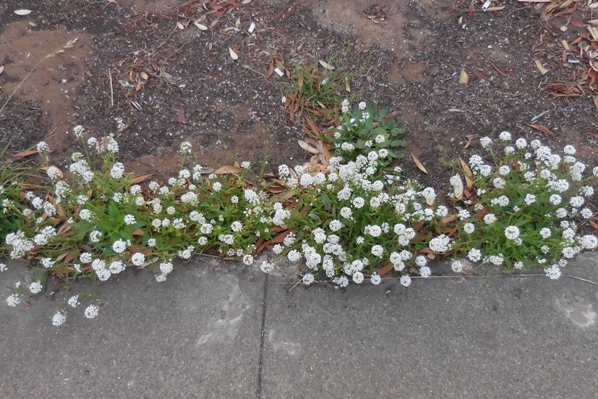 Even at that busy intersection, the scent of the moment was the honey fragrance from the self-seeded sweet alyssum. I love how nature fills in gaps with life and beauty. Here’s another picture of the grass under the trees. You can see where it turns patchy outside the tree’s dripline. 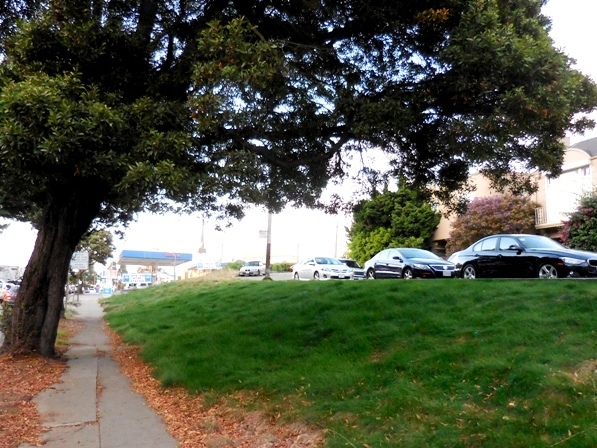 I was delighted to see a row of trees planted all along the sidewalk here. 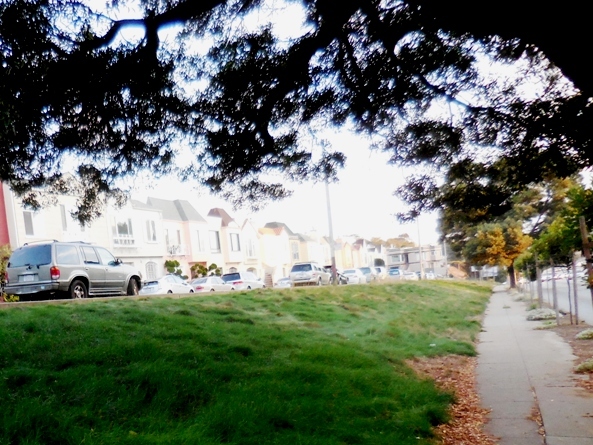 When they’re grown, they’ll help the homes back there, fighting the pollution from the heavy traffic on Junipero Serra. They’ll absorb some of the traffic noise. They’ll provide a pleasing visual barrier. 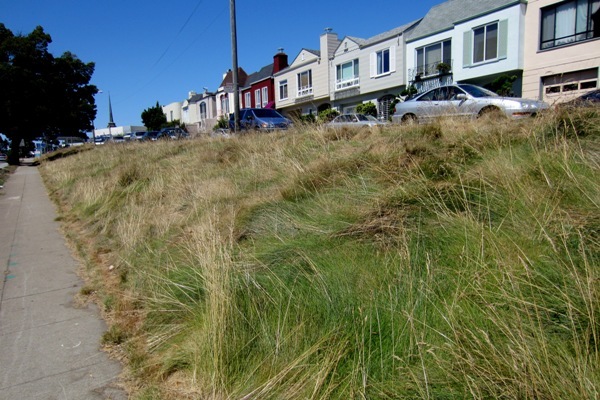 And they’ll shade the no-mow fescue grass and it will be green.